make appointments, accept payments, send reminders, and more. 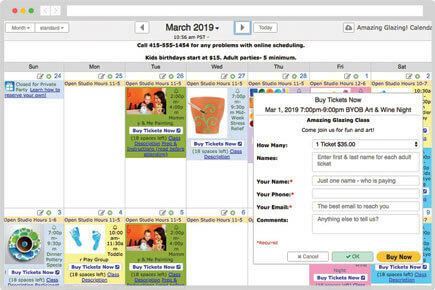 People can see available bookings on your calendar, click & fill out a form to make a reservation. You can accept bookings automatically or they can be held for your approval. 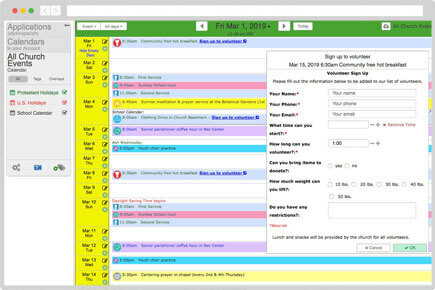 Accept online bookings for appointments, events, classes, and meetings. 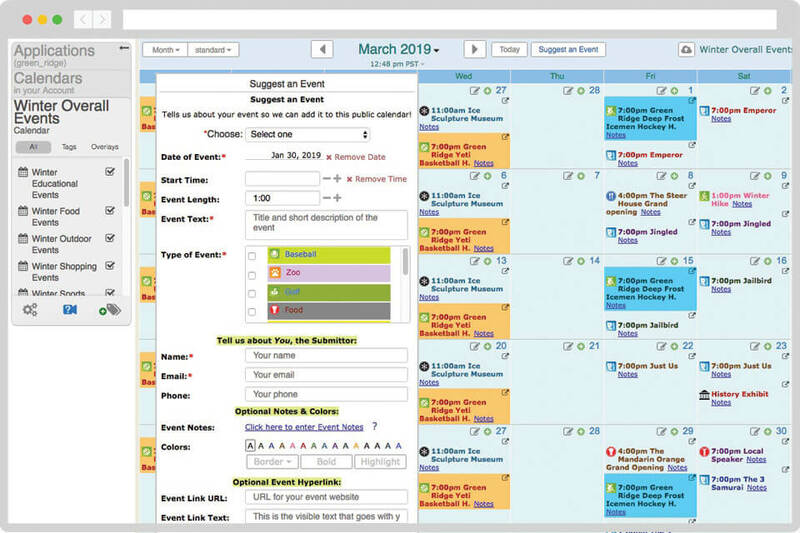 Accept visitor suggestions for public events on your calendar. You can even accept bookings directly from your Facebook page! 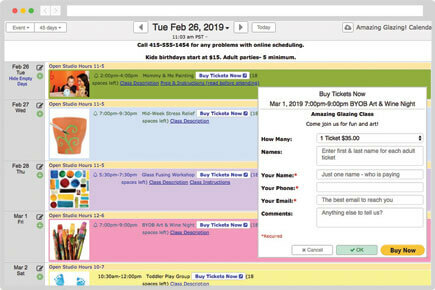 You can embed your customized Self-Book calendar into any webpage. 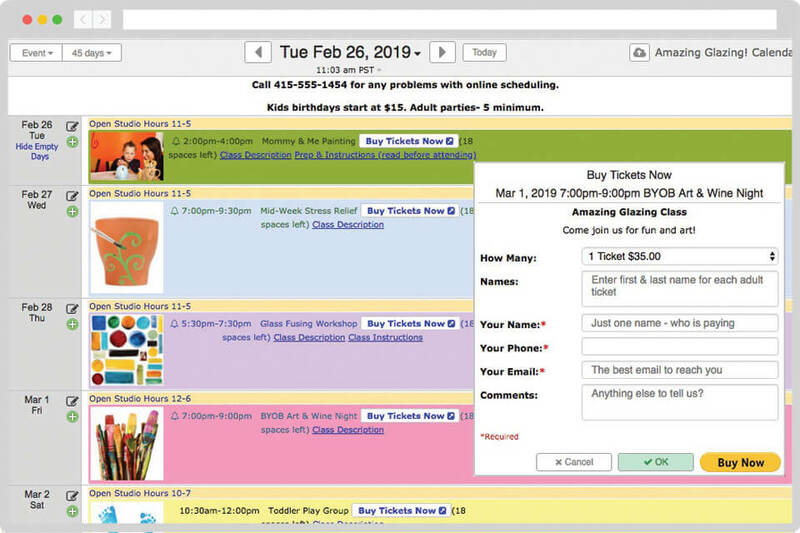 Customers can then see your availability and book events directly from your website. 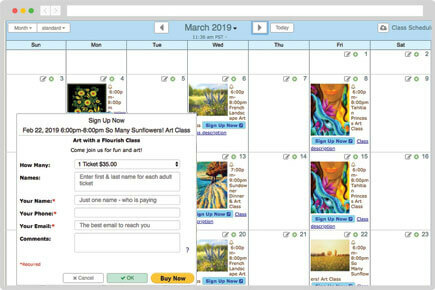 Customize the signup forms that visitors fill out to book your events. Conflict detection prevents bookings from overlapping and you can set custom signup limits for events. Accept payments for events automatically using PayPal. One low, flat fee - we don't take a slice of every sale. PayPal is easy for your customers to use and makes sure you get paid. Send automated reminders, acceptance, rescheduling, and cancellation notifications to your customers. You can send these notifications by email and/or text message. 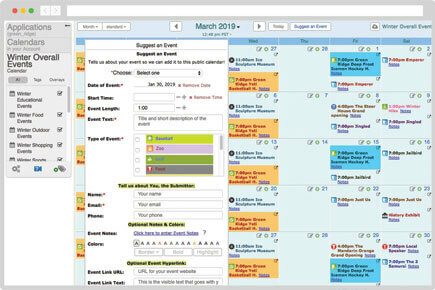 Click here to explore a demo calendar. Group reservations for a paint-your-own art class. 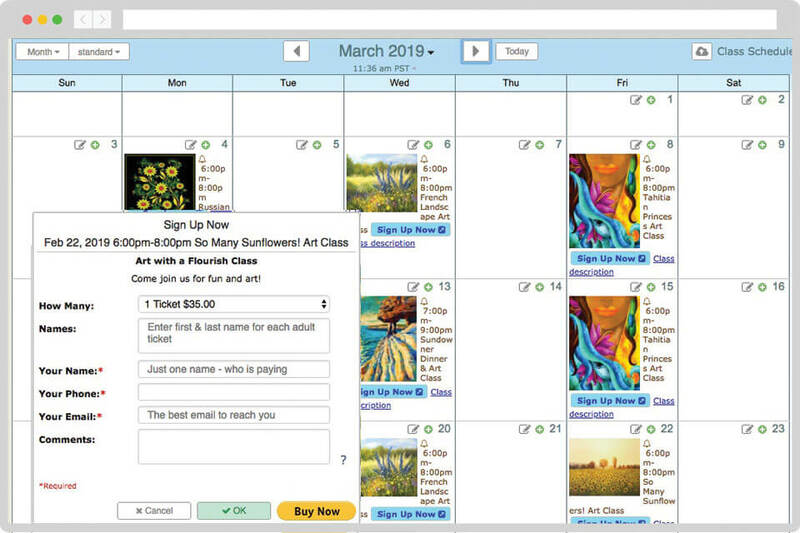 This is the same paint-your-own art class signup but in "event" view. See how you can have visitors pre-pay for your events with PayPal. Community calendar where visitors can suggest events to be added. Sign-up for a professor's office hours. 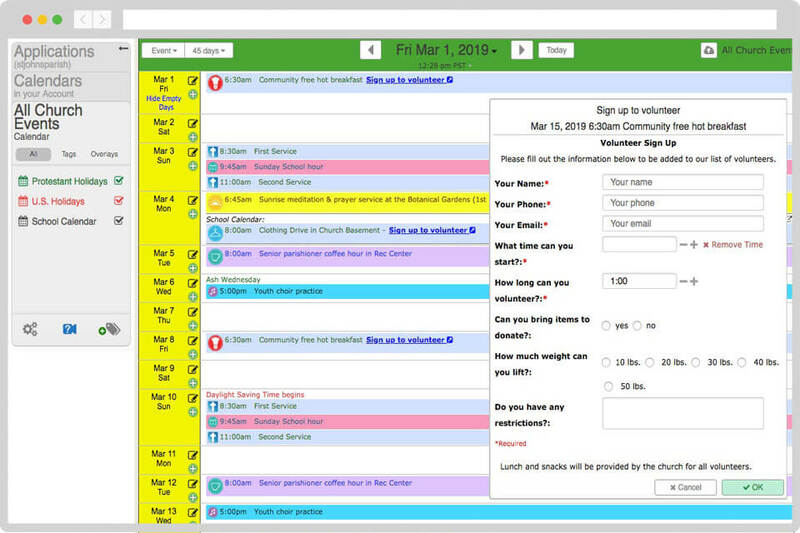 Signup for volunteer events on a church calendar. 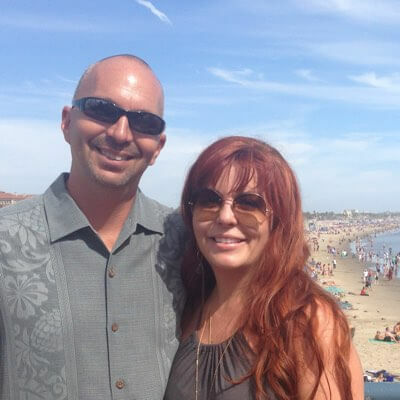 “Having Keep&Share’s system to offer our schedule of classes to our students is like having an added employee. That manages bookings and payments. The upside is not only all the updates that continue to come out making the system even easier and more features to stream line our paperwork. But at a fraction of the cost of the “main stream” big names services. Keep&Share gives us personal, professional attention that is worth the monthly fee. I highly recommend this service. It has enabled us to spend more time on gaining new customers. At the same time, Keep&Share runs in the background to effectively manage customers bookings. Do I need to purchase an account with Self-Book? Yes. Self-Book is an "add-on" feature with a separate cost that can only be used with a paid subscription. This means that you'll need to purchase either a Solo or Team plan as well as the Self-Book add-on. See our plans & pricing here. Will I get support during my free trial? Yes. All Self-Book customers get a free setup consultation when you’re first getting started, as well as phone + email support throughout your trial and as long as your Keep&Share subscription lasts. And we’ve got real people answering, too. 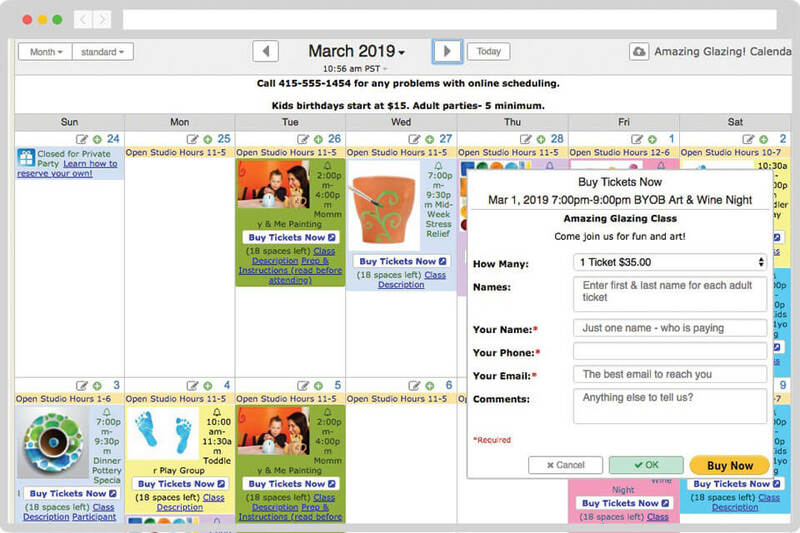 Can this appointment calendar take payments for my events? Yes. Keep&Share Self-Book can integrate with PayPal, which takes most major credit/debit cards. It can be required for your event, optional, or not even mentioned. We’ll give you good directions on how to set it up, and we’re only a phone call or email away if you have any questions. Does Keep&Share take a percentage of my sales through my online calendar? No. Unlike many event-scheduling & registration software programs, we don’t take a cut of your fees — we only charge one low, flat fee each month for the Self-Book package. You can even get 2 months free if you pay annually, and you get a 30% discount if you’re a nonprofit. Will my customers see who has made other appointments? No. Only the calendar owner (and anyone you gave Edit Rights to the calendar to) can see who made the reservations, unless you choose to display it. The privacy of your business and your clientèle is guarded by Keep&Share. Do my customers/volunteers (etc.) have to sign up for your website to use this? No. 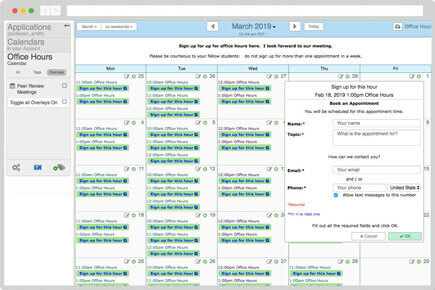 You can make your calendar publicly bookable so that all they need to do is fill out a form. 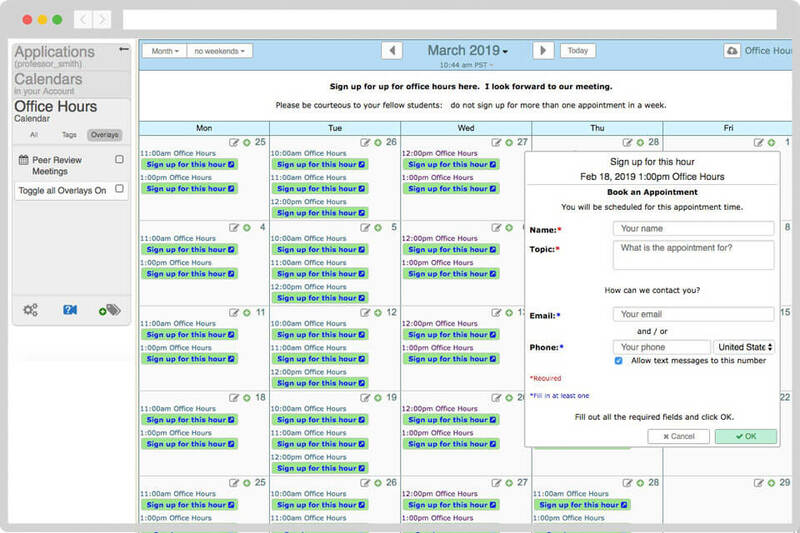 If you want to be more selective though, you can share your appointment calendar privately with a group of accounts. (This is helpful if a boss wants to certain employees request meetings or time off, for example).